The Rideau Hall Cricket Clubhouse is significant for its association with the English game of cricket that was imported to Ontario from Britain in the 19th century. 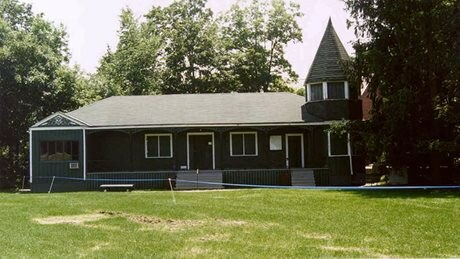 The Ottawa Cricket Club was established in 1849. In 1865, Governor General Lord Monck set aside 10 acres (4.5 hectares) at Rideau Hall specifically for cricket. The clubhouse, built in 1892, was constructed in the traditional English-style clubhouse architecture, with decorative millwork incorporating the initials of the Ottawa Cricket Club. In the early 1900s, American cricket teams were frequent competitors on the pitch. In the 1920s, three new Ottawa clubs were formed and their matches were played at Rideau Hall. These clubs still comprise the Rideau Hall Cricket Association, which continues to play on the historical pitch in front of the Rideau Hall Clubhouse (designated in 1987). Today, cricket remains a popular sport among Ontarians. Visit the clubhouse at 212 MacKay Street in Ottawa, Ontario. Read more about this heritage-designated building on the Canada’s Historic Places website. Learn more about the history of cricket in the Ottawa area on the official website of the Ottawa Cricket Club.